Construction Booming in North Korea, But Who's Paying? Beachfront, five-star hotels? Skyscrapers just blocks from Kim Il Sung Square? But the chronically cash-strapped government appears to be nurturing a fresh source of revenue — sales of property to the newly affluent class of North Koreans who have made their fortunes on the country's growing, but still largely unofficial, market economy that has come into its own since Kim assumed power. The construction projects, which could cost well over a billion dollars to complete, have a lot of momentum behind them. They are part of a six-year building spree under Kim that has transformed the Pyongyang skyline. North Korean officials told The Associated Press they hope to have at least some of the developments ready to show off for celebrations in September marking the country's 70th anniversary. 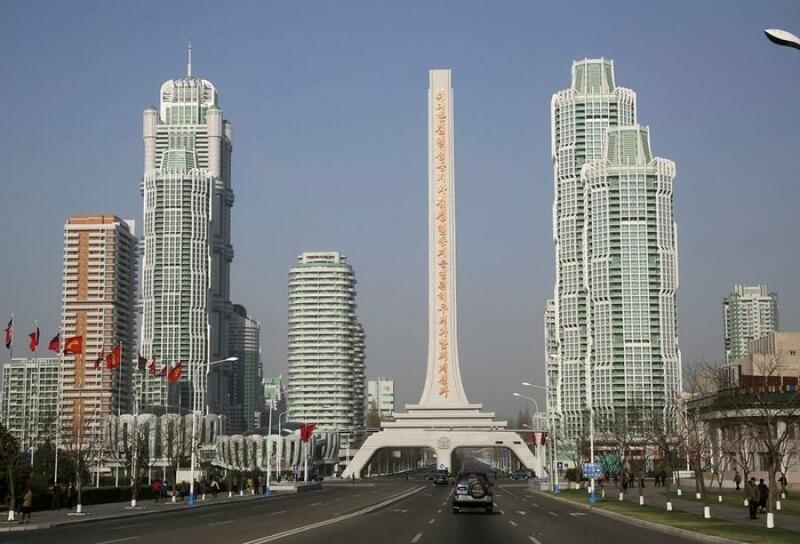 First, to redevelop the center of Pyongyang by replacing low-rise housing built after the 1950-53 Korean War with more space-efficient new skyscrapers, offices, public buildings and residential high rises. “For the center of the city there are many old residences, so we are trying to turn that into new ones,” Kim explained. On the east coast's Wonsan-Kalma area, more than 10 hotels, thousands of units of residential housing and a number of recreational facilities are either planned or underway, Kim said. He said the hotels would range from relatively modest three-star facilities to luxury five-star resorts. Kim Jong Un has already built a new airport to serve the area known as his home away from home. In theory, housing, education and health care are provided free to all in socialist North Korea, where the state owns all capital, including the buildings, factories and land. Selling property outright, or collecting rents, would pull money out of the pockets of those who can afford it, putting it back into the coffers of the regime. Demanding prepayment could help finance projects underway or in the planning stages. Chinese investment has generally been seen as the key source of funds. So has slow but steady growth in the North's domestic economy, helped along by a swelling sector of entrepreneurs who have savings in foreign currencies like the U.S. dollar and Chinese yuan. These people, known as “donju,” or money masters, have been more visible since Kim Jong Un assumed power, creating a natural market for better housing that didn't exist in the past. Most live in Pyongyang and the Wonsan area, where construction is most active. A big part of the building boom is focused on high-end properties in prime locations, like the Pyongyang city center or along riversides or ocean fronts that might be expected to appeal to them most — and have a higher market value. William Brown, an economist at Georgetown University, said the “liquidation” of some state property makes fiscal sense, despite the cost to socialist principles, especially given North Korea's chronic trade deficit with China. The downturn in Chinese trade and new investment since about September and Kim's inability to get foreign loans or woo other investors has cast serious doubt on the future of the economic boom and is jeopardizing funding for the military, said Benjamin Katzeff Silberstein, a scholar with the U.S.-based Foreign Policy Research Institute think tank and co-editor of the North Korea Economy Watch website. “The state really doesn't have any sustainable revenue source as of now,” Silberstein said.